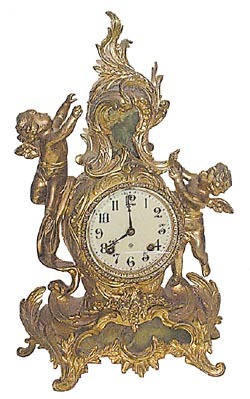 Ansonia Clock Co. mantle clock, "Criterion", ca 1904. The metal case is 17 inches high and has Brazilian green onyx panels on the base and top. The metal is finished in Barbedienne, of the gold family of finishes. 90% or more of the finish is still holding. One piece porcelain dial, Rocco sash, beveled glass, all very good. 8 day movement, half hour gong strike. Another outstanding clock from the Miller collection. Ly-Ansonia No.1547.